MAKVOLT IS A RENOWNED BRAND IN THE INDIAN POWER ELECTRONICS INDUSTRY PROVIDING LEADING-EDGE POWER SOLUTIONS AT VALUE PRICES. Makvolt Power (formerly known as Volta Powerlink Pvt Ltd) is a leading manufacturer of uninterruptible power supplies (UPS) and power conditioning and backup products. It is an ISO 9001: 2008 certified company and one of the few manufacturers offering the full range of power protection products which are widely used in several cities all around the country. Makvolt Power (formerly known as Volta Powerlink Pvt Ltd) was founded by a dedicated team of engineers, technocrats and business entrepreneurs with the vision to set up a world-class power electronics company. For over 15 years now, the company has been growing steadily and producing top quality and most reliable power products at competitive prices. 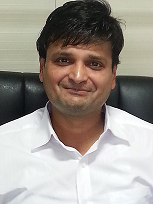 Under the dynamic leadership of Mr. Sandeep Agarwal, the company has sealed its reputation for innovative power protection technology, superior product quality and outstanding customer service. Makvolt Power has a wide range of power conditioning and backup solutions for providing clean power to your electrical and electronic appliances and continuous power supply in case of power failure. Power protection has become crucial because of the increasing disturbances of power grids or utility power. Business can't afford downtime from utility power blackouts and mission-critical applications and sensitive equipment require protection from damaging voltages, surges and transients. Constant Voltage Transformers (CVTs) - 150 VA to 5 kVA (1-phase) & upto 15 kVA (3-phase). Makvolt Power aims to provide its clients with the highest standard of support, training and professional expertise in the industry. We specialize in Annual Maintenance Contract (AMC) and repairs to any type of Power Conditioning Equipment for all brands. We have entered into AMC contracts for repairing & servicing with many renowned government and corporate bodies. Makvolt Power's solutions are designed to effectively serve the power system needs of the industrial, institutional, government, education, commercial, residential, IT, telecom, healthcare, printing and retail applications with maximum system availability and uptime. We provide you with the most efficiently engineered power protection solutions for each technology or runtime requirement. Today Makvolt Power is addressing the requirements of a huge mass of end-users as well as dealers. Makvolt Power (formerly known as Volta Powerlink Pvt Ltd) has a centralized set-up in Mumbai that houses its production, testing and deliveries. The well-groomed set-up ensures tight quality controls apart from of course ensuring timely and speedy deliveries. With over 15 years of experience in the industry, the Makvolt Power (formerly known as Volta Powerlink Pvt Ltd) team is capable to provide solutions to the most complex requirements in quick time. With a well-grounded team of dedicated engineers, Makvolt Power (formerly known as Volta Powerlink Pvt Ltd) endeavors and focuses on continuously working on improving the quality of its production, testing and delivery processes thereby providing you with delightful customer service at all times. Makvolt Power (formerly known as Volta Powerlink Pvt Ltd) has deployed (and continuously upgrades) a resourceful team of production engineers, R&D personnel and testing engineers in pursuit of its vision of being a leader in the power electronics space.